I grew up watching Mr. Rogers’ Neighborhood on a daily basis. He is one of those people you never have to meet in person to feel you utterly know and love. His voice was so peaceful and his embodiment of community, nurturing, and imagination so total and profound that he still functions like a security blanket for me – one look at his face and I’m instantly calm and content. I also happen to think Daniel Tiger is the most amazingly gentle and wise being that ever existed (yes, I use that word loosely). If I ever have a son he will be named Daniel in his honor. And because I love that name; I’m not entirely batty. 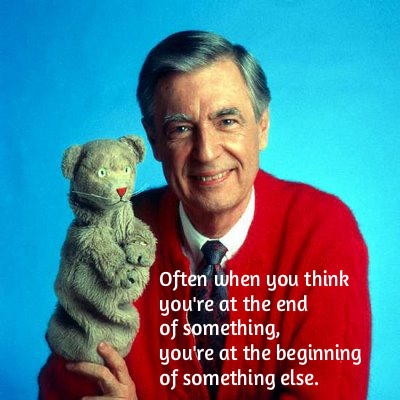 So of course Mr. Rogers would come up with the single most optimistic, encouraging, life-affirming statement of all time. Of course he would say, “Often when you think you’re at the end of something, you’re at the beginning of something else.” Mr. Rogers is nothing if not a man who miraculously transforms your feelings – from despair to solace, gloominess to good cheer, limitations to opportunities – every time he opens up his mouth. And every time I read this quote it applies to something new – whatever is going on in my life at the moment. Currently, it’s a reminder that though my charmed apartment life is soon coming to an end, I now have the impetus to downsize my worldly possessions in preparation for traveling the world. I have the chance to see things with the new perspective that comes with a move. My fresh start affords me the possibility of making new friends, finding new places to love, and reassessing what is really important in my life. And if worse comes to worst and I hate my new apartment, that could motivate me to bury myself in studying French instead… Although I really hope that will not be the case! « weekend weekend weekend yay!